It’s not the Muslim Hajj, or the Hindu Kumbh Mela.. Known as Arbaeen, it is the world’s most populous gathering and you’ve probably never heard of it! Not only does the congregation exceed the number of visitors to Mecca (by a factor of five, in fact), it is more significant than Kumbh Mela, since the latter is only held every third year. In short, Arbaeen dwarfs every other rally on the planet, reaching twenty million last year. That is a staggering 60 % of Iraq’s entire population, and it is growing year after year. Above all, Arbaeen is unique because it takes place against the backdrop of chaotic and dangerous geopolitical scenes. Daesh (aka ‘Islamic State’) sees the Shia as their mortal enemy, so nothing infuriates the terror group more than the sight of Shia pilgrims gathering for their greatest show of faith.There’s another peculiar feature of Arbaeen. While it is a distinctively Shia spiritual exercise, Sunnis, even Christians, Yazidis, Zoroastrians, and Sabians partake in both the pilgrimage as well as serving of devotees. This is remarkable given the exclusive nature of religious rituals, and it could only mean one thing: people regardless of color or creed see Hussein as a universal, borderless, and meta-religious symbol of freedom and compassion.Why you have never heard of it probably has to do with the fact that the press is concerned more with negative, gory, and sensationalized tabloids, than with positive, inspiring narratives, particularly when it comes to Islam. If a few hundred anti-immigration protestors take to the streets in London and they will make headlines.. The same level of airtime is awarded to a pro-democracy march in Hong Kong or an anti-Putin rally in Russia.. But a gathering of twenty million in obstreperous defiance of terror and injustice somehow fails even to make it into the TV news ticker! An unofficial media embargo is imposed on the gargantuan event despite the story having all the critical elements of an eye-catching feature; the staggering numbers, the political significance, the revolutionary message, the tense backdrop, as well as originality.. But when such a story does make it through the editorial axe of major news outlets, it creates shock waves and touches the most random people.Among the countless individuals inspired by it, is a young Australian man I met several years ago who had converted to Islam. Evidently, no one takes such a life-altering decision lightly, so upon inquiry he told me it all started in 2003. One evening, as he was watching the news only to be drawn by scenes of millions streaming towards a holy city known as Karbala, chanting the name of a man he had never heard of: “Hussein”. For the first time in decades, in a globally televised event, the world had caught an glimpse into previously suppressed religious fervor in Iraq.With the Sunni Ba’athist regime toppled, Western viewers were eager to see how Iraqis would respond to a new era free from dictatorship persecution. The ‘Republic of Fear’ had crumbled and the genie had irreversibly escaped from the bottle. “Where is Karbala, and why is everyone heading in its direction?” he recalls asking himself. 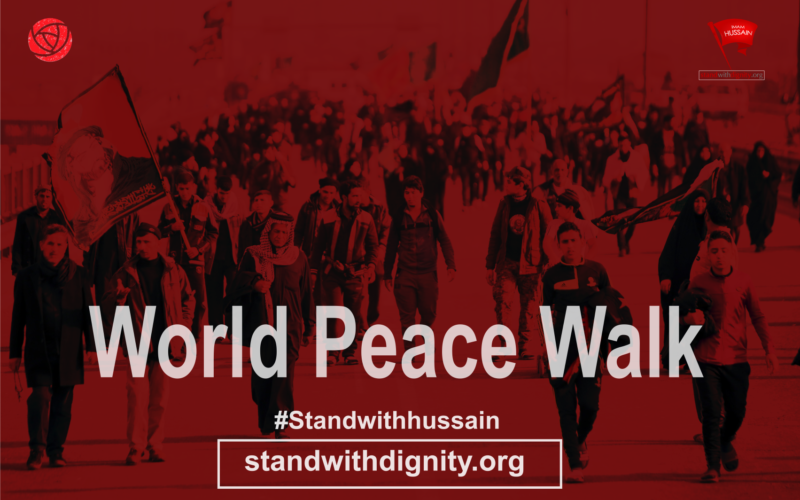 “Who is this Hussein who motivates people to defy all the odds and come out to mourn his death fourteen centuries after the fact?”What he witnessed in that 60-second report was especially moving because the imagery was unlike any he had ever seen. A fervent sense of connection turned human pilgrims into iron filings, swarming together other as they drew closer to what could only be described as Hussein’s irresistible magnetic field. “If you want to see a living, breathing, lively religion, come to Karbala” he said.How could a man who was killed 1396 years ago be so alive and have such a palpable presence today that he makes millions take up his cause, and view his plight as their own? People are unlikely to be drawn into a dispute (much less one that transpired in ancient times) unless they have a personal interest in the matter. On the other hand, if you felt someone was engaged in a fight over your right to freedom, your prerogative to be treated justly, and your entitlement to a life of dignity, you would feel you had a vested interest and would empathize with him to the point where conversion to his beliefs is not a far-fetched possibility. Hussein, grandson of the Prophet Muhammad, is revered by Muslims as the “Prince of Martyrs”. He was killed in Karbala on a day which became known as Ashura, the tenth day of the Islamic month of Muharram, having refused to pledge allegiance to the corrupt and tyrannical caliph, Yazid.He and his family and companions were surrounded in the desert by an army of 30,000, starved of food and water, then beheaded in the most macabre manner, a graphic tale recounted from pulpits every year since the day he was slain. Their bodies were mutilated. 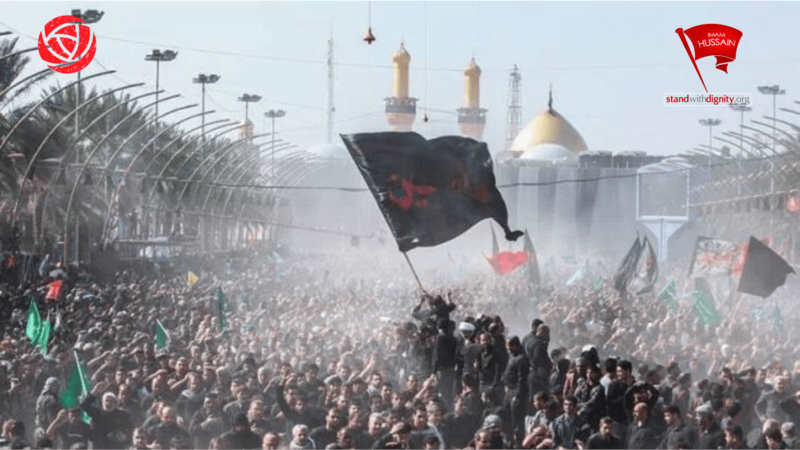 In the words of the English historian Edward Gibbon: “In a distant age and climate, the tragic scene of the death of Hussein will awaken the sympathy of the coldest reader.”Shia Muslims have since mourned the death of Hussein, in particular on the days of Ashura, then, forty days later, on Arbaeen. Forty days is the usual length of mourning in many Muslim traditions. This year, Arba’een falls on Friday 12 December. 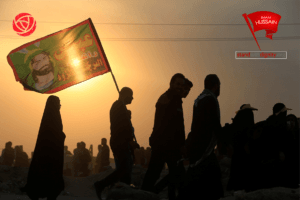 The message recalls an epic recited by Abbas, Hussein’s half-brother and trusted lieutenant, who was also killed in theBattle of Karbala in 680AD while trying to fetch water for his parched nieces and nephews. With security being in the detrimental state that makes Iraq the number one headline in the world, no one doubts that this statement is genuine in every sense. Free lunch.. And dinner, and breakfast! One part of the pilgrimage which will leave every visitor perplexed is the sight of thousands of tents with makeshift kitchens set up by local villagers who live around the pilgrims’ path. The tents (called ‘mawkeb’) are places where pilgrims get practically everything they need. From fresh meals to eat and a space to rest, to free international phone calls to assure concerned relatives, to baby diapers, to practically every other amenity, free of charge. In fact, pilgrims do not need to carry anything on the 400 mile journey except the clothes they wear.More intriguing is how pilgrims are invited for food and drink. Mawkeb organizers intercept the pilgrims’ path to plead with them to accept their offerings, which often includes a full suite of services fit for kings: first you can a foot massage, then you are offered a delicious hot meal, then you are invited to rest while your clothes are washed, ironed, then returned to you after a nap. All complimentary, of course.For some perspective, consider this: In the aftermath of the Haiti earthquake, and with worldwide sympathy and support, the UN World Food Programme announced delivery of half a million meals at the height of its relief efforts.. The United States military, launched Operation Unified Response, bringing together the massive resources of various federal agencies and announced that within five months of the humanitarian catastrophe, 4.9 million meals had been delivered to Haitians. Now compare that with over 50 million meals per day during Arbaeen, equating to about 700 million meals for the duration of the pilgrimage, all financed not by the United Nations or international charities, but by poor laborers and farmers who starve to feed the pilgrims and save up all year round so that visitors are satisfied. Everything, including security is provided mostly by volunteer fighters who have one eye on Daesh, and another on protecting the pilgrim’s path. “To know what Islam teaches,” says one Mawkeb organizer, “don’t look at the actions of a few hundred barbaric terrorists, but the selfless sacrifices exhibited by millions of Arbaeen pilgrims.”In fact, Arbaeen should be listed in the Guinness Book of World Records in several categories: biggest annual gathering, longest continuous dining table, largest number of people fed for free, largest group of volunteers serving a single event, all under the imminent threat of suicide bombings. 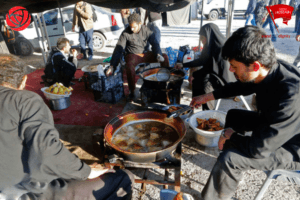 The horrific bomb blasts which occur year-round, mostly targeting Shia pilgrims and taking countless lives, illustrate the dangers facing Shias living in Iraq, and the insecurity that continues to plague the country. Yet the imminent threat of death doesn’t seem to deter people – young and old, Iraqis and foreigners – from making the dangerous journey to the holy city.It isn’t easy for an outsider to understand what inspires the pilgrims. You see women carrying children in their arms, old men in wheelchairs, people on crutches, and blind seniors holding walking sticks. I met a father who had travelled all the way from Basra with his disabled boy. The 12-year-old had cerebral palsy and could not walk unassisted. So for a part of the trek the father put the boy’s feet on top of his and held him by the armpits as they walked. It is the kind of story out of which Oscar-winning films are made, but it seems Hollywood is more concerned with comic heroes and with real life heroes whose superpower is their courage and commitment. Visitors to the shrine of Hussein and his brother Abbas are not driven by emotion alone. 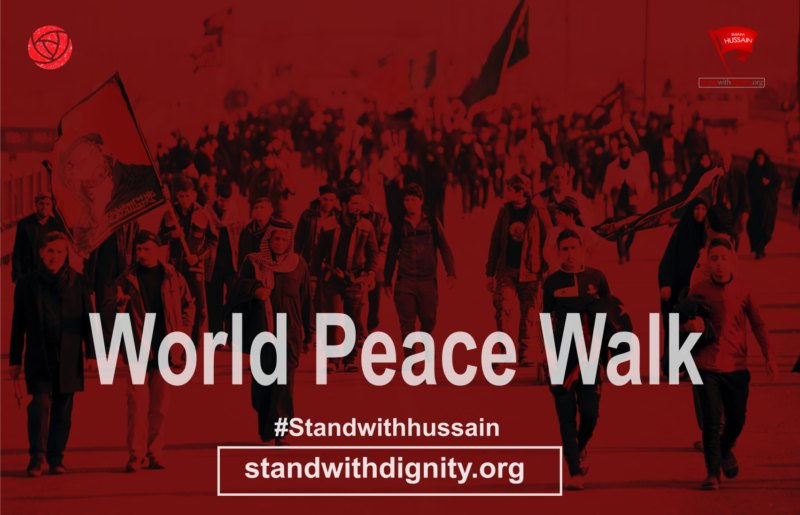 They cry be reminded of the atrocious nature of his death, in doing so, they reaffirm their pledge to his ideals.The first thing that pilgrims do upon reaching his shrine is recite the Ziyara, a sacred text which summarizes the status of Hussein. In it, they begin the address by calling Hussein the “inheritor” of Adam, Noah, Abraham, Moses and Jesus. There is something profound in making this proclamation. It shows that Hussein’s message of truth, justice, and love for the oppressed is viewed as an inseparable extension of all divinely-appointed prophets.People go to Karbala not to marvel at the city’s landscape – lush with date palms, or to admire the mausoleum’s physical beauty, or to shop, be entertained, or to visit ancient historical sites. They go to cry. To mourn and experience the angelic aura of Hussein. They enter the sacred shrine weeping and lamenting the greatest act of sacrifice ever seen.It is as though every person has established a personal relationship with the man they have never seen. They talk to him and call out his name; they grip the housing of his tomb; they kiss the floor leading into the shrine; they touch its walls and doors in the same manner one touches the face of a long-lost friend. It is a picturesque vista of epic proportions. What motivates these people is something that requires an understanding of the character and status of Imam Hussein and the spiritual relationship that those who have come to know him have developed with his living legend.If the world understood Hussein, his message, and his sacrifice, they would begin to understand the ancient roots of Daesh and its credo of death and destruction. It was centuries ago in Karbala that humanity witnessed the genesis of senseless monstrosities, epitomized in the murderers of Hussein. It was pitch black darkness v. Absolute shining light, an exhibition of vice v. a festival of virtue, hence the potent specter of Hussein today. His presence is primordially woven into every facet of their lives. His legend encourages, inspires, and champions change for the better, and no amount of media blackout can extinguish its light.”Who is this Hussein”? For hundreds of millions of his followers, a question this profound, which can cause people to relinquish their religion for another, can be answered only when you have marched to the shrine of Hussein on foot.